Super is certainly not the word I would use to describe this car wash. I went on Saturday September 1st. I spent $18.50 and left with a vehicle that still needed to be washed when I got home. I complained to the attendant; I asked him what kind of soap they were using because they were no subs and the fluid felt like nothing more than water. I used the brush that was dispensing pink soap, so pink that it actually colored three plastic attachments on my vehicle, as well as, my hands. I told the attendant to look at the dirt and explained that this is just dust and highway dirt, the vehicle has not been off road. He took the wand and started spraying himself,as if he had the magic touch, but the results were no better. He told me that no car wash will get that off. I told him that it was my first visit and it will be my last, normally I use the car wash further down the street, which for some incredible reason is able to get the dirt off but thought I would give this place a try. An $18.50, and two hour (had to complete job at home) mistake. He told me to come back to talk to the manager, I asked about the owner, he told me his name is Paul John and he lives in Vancouver. I would not recommend this car wash to anyone! I wish I could attach pictures as it is bizarre how the pink soap in the brush stained everything but also I would love to be able to show the dirt that it would not remove....crazy. The automatic wash stopped working as we were inside. The lights told us to back up, so we backed up. The wash just then completely died. The attendant told us we would have to go through again and reset it. Not wanting to wait in line again, the driver asked to have her money refunded. The attendant refused. She then asked for a voucher to come through at another time. The attendant then started an argument with her, saying it wasnt their fault that she wrecked the computer. Frustrated, the driver left, with soap stained windows and money paid for nothing but the worst service I have ever seen. Best wash in Penticton. Long hours and two robotic wash bays. Discount on washs if you fuel up at the Ottor Cooperative Gas and store. 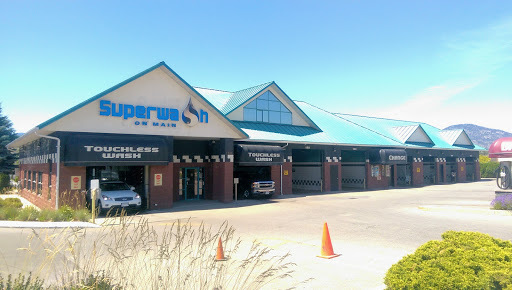 The Super wash has several bays for coin operated pressure wand cleaning that is cheaper than the automatic bays. Large enough for Big Trucks and vehicles. And moterhomes. Also vacuums and area to detail your vehicle. HELP PLEASE...I am searching for some contact details for the owners or managers of Superwash. I used the spray and wash today and have an issue i need to report. I have tried calling the number available and it just goes to a fax machine. There was nobody in the office and it seems there is no way to make contact with anyone. Help? While it was not super, it was packed with customers. The staff did their jobs, the touchless wash was average. Expect to pay between $8-$12 plus extra coin for their self-vacuum and shampoo station. After $12 I decided the wash was mediocore. Rick did an awesome job on my prewash, and hes super friendly. A good smile and positive attitude really makes a business, that can appear plain Jane, into something to brighten my day. Thank you Rick. They place isnt fancy but it has all the basics and doesnt have a long wait to drive in. Attendant doesnt know what he is talking about. I do not recommend. Poor service. Great water pressure, clean stalls, good time for a toonie. Everything was good except the vacuum was horrible. Great car wash. Super helpful, friendly staff!! Got the flood mud + farm grot off! Yeah! Excellent touch less car wash!